Our second campaign billboard on Interstate-35. This particular billboard was dedicated to the /r/bitcoin/ community on Reddit. We also have a few more images of the billboard available. Thanks to the wonderful support of the /r/bitcoin/ community, our campaign has now installed a second billboard on the Interstate! This billboard is dedicated explicitly to supporting net-neutrality. It is located on the upperdeck northbound side of IH35 just north of Manor Road. Unlike our existing billboard just a few miles north, this billboard will only run for a 24-hour period. 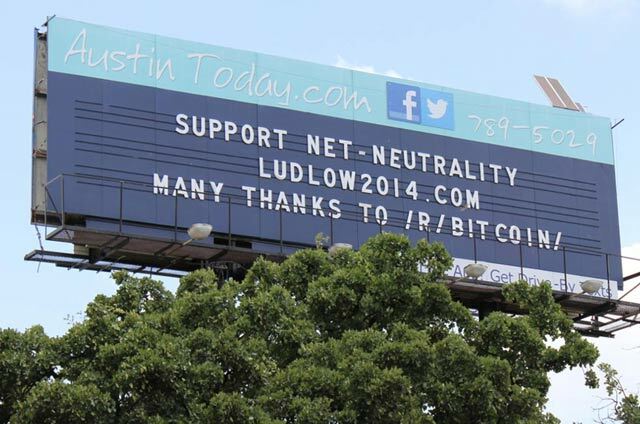 It is our hope to get Austinites asking questions about net-neutrality any way we can. And of course we're hoping it also drives people to consider our campaign themes of sensible drug policies, equality for the LGBT community, and civil liberties. Thank you to the amazing and generous people of /r/bitcoin/ who made this billboard possible. Last month's AMA on /r/bitcoin/ drove over 16,000 people to our campaign website! We could not be doing this well without your continued support and exposure!